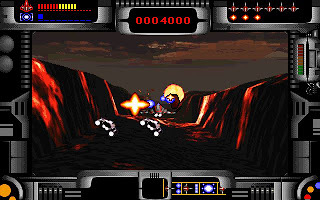 Novastorm is a shoot'em up developed by Psygnosis in 1994. It is really an eye-opener when I first see it running in one computer centre in a shopping complex. The amazing graphics plus the great sound system in that computer immediately attract my attention. After I stand in front of it for a few minutes, I have only one word to describe it - "Unbelievable"!! 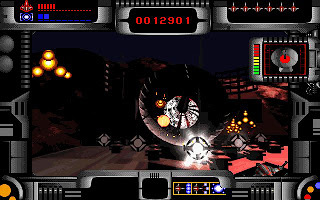 Novastorm briliantly combines full motion videos and the animated sprites. The background is pre-rendered, and move in a really fast way. The developer manage to integrate the background into the gameplay nicely where we will be hit if fail to avoid the ever changing background. Besides graphics, the digitized soundtrack in Novastorm is amazing. The techno music with strong bass complement with the already fast pace gameplay very well. I can really feel my heart beat move along with the sountrack. The story of Novastorm start in year 2429. Humans have left earth in several huge arks containing Earth's ecosystem, in search of a new paradise. They have become complacent, everything is controlled by artificial intelligence, while the human race sleeps and dreams of its new home. The computer systems evolve however, and prophetize of a conquest of silicon against flesh. We take control of the Scavenger 4 squadron, which has a mission to destroy the deadly Scarab-X forces, in the last hope for the Human race. 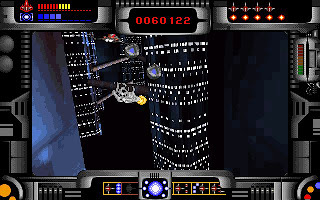 The gameplay of Novastorm is simple, but challenging. 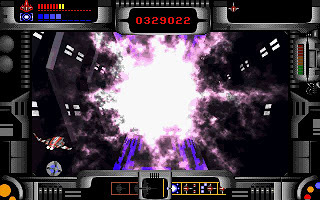 We need to hit the enemies, collect upgrade credits and build up our fire power. At first, we have only a poor single shot fire weapon. Slowly, we can upgrade the weapon to triple shot fire together with homing missles, drones and wing man. 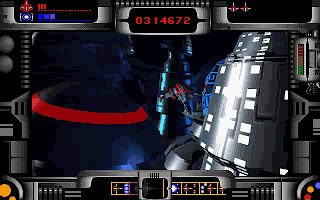 The bosses at the end of each level is huge and hard to overcome. To be able to get through them, we need to memorize their movement pattern so that won't be hit by their super weapon. 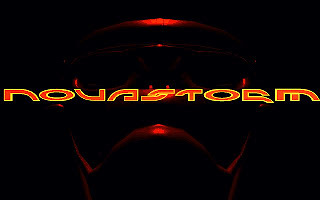 You can download Novastorm here. It is a huge 420MB ISO CD image. 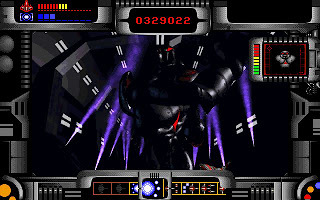 You need to mount it using Daemon Tools and type "mount e f:\ -t cdrom -usecd 0" in DosBox to mount the CD before running it. My original CD got scratched to Hell. Thanks for the backup I couldn't take prior. To be safe, I've backup all my old titles in ISO format :) Hope you enjoy this great game as do I. Hey, I got Deamon and then unzipped this but halfway through I get- CRC failed, the file is corrupt. Help!! do you have a gamerip? do you have a sountrack for this game? The ISO is ok. Try download again using Flashget or other download manager. John, the link from Catherine might work? Cherry, file is corrupted. I downloaded with Flashget and still does the same. Can you upload only the image? Miakoda, can u send me the download link plz? I will now download Cheery´s file, since he said he uploaded again, just in case. I'm having trouble getting the download to start. I went to http://www.pmtgames.com/novastrm.htm and followed the directions. Used IE. No popup blocker. There doesn't seem to be a link to the download. Help? Did you click on one of the link? The download link will pop-up once you clicked on a link. Just try it myself, no problem.